When I first heard that PETA had released videos of maternal-deprivation experiments on baby monkeys, I guessed that it was some kind of retrospective on the infamous experiments by Harry Harlow that were going on back when I was in college in the ’60s. And like most people, including Dr. Jane Goodall, I thought these experiments had been relegated to the trash heap of history long ago, that they only existed in textbooks as examples of questionable and unethical practices that we condemn these days. I was wrong. . . . These barbaric experiments weren’t justifiable 60 years ago, they certainly aren’t justifiable in the 21st century, and they do not deserve the support of Congress and taxpayers. He was joined by honorary host U.S. Rep. Lucille Roybal-Allard of California, who recently led other members of Congress in writing to NIH to request a formal scientific and ethical review of these “troubling” experiments and to ask NIH to submit a report by the end of February. 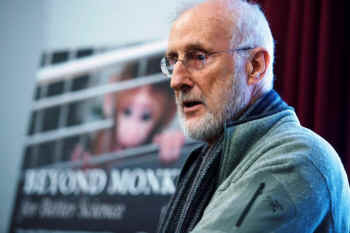 Attendees also heard from renowned experts in the fields of psychology, anthropology, and neuroscience as they discussed the experiments’ harm to animals, their inapplicability to human health, and why Congress should support the modern non-animal research methods that are readily available to study causes of and treatments for human mental illness. The speakers included Dr. John Gluck, professor emeritus of psychology at the University of New Mexico and research professor at the Kennedy Institute of Ethics at Georgetown University, who used to conduct these experiments; Dr. Barbara King, chancellor professor of anthropology at the College of William & Mary who studies monkeys and great apes, and Dr. Katherine Roe, a PETA research associate and former NIH neuroscientist. As revealed in video footage released by PETA, which Cromwell screened for the audience, NIH experimenters at a laboratory in Maryland breed monkeys to be prone to depression, tear infants away from their mothers at birth to induce trauma, and then subject the young ones to years of experiments designed to cause, worsen, and measure the babies’ severe fear, depression, and anxiety. These experiments have never led to the development of treatments for human mental illness and are superseded by human brain-imaging and other modern techniques. Yet they have continued for more than 30 years and cost taxpayers more than $30 million in the past seven years alone. Already, more than 175,000 PETA supporters have bombarded NIH with e-mails and phone calls demanding an immediate end to these torturous experiments. Help us keep the pressure on by urging your members of Congress to join their colleagues and take steps to end NIH’s cruel experiments. 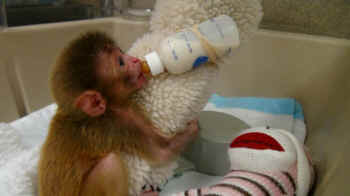 Urge Congress to Take Action for Baby Monkeys and Tell NIH to Stop Tormenting Infant Monkeys.